Kaye makes all her own Holly Wreaths using wire frames, moss and the freshest traditional materials of Holly’s, Pines, Ivy’s, Fir Cones, Fruit Slices, Cinnamon Sticks & Walnuts with quality Ribbon Bows. Suitable for placement on a grave or hanging on your door in various sizes ranging from 8” frames up to 20” frames. These are available to pre order before December & available to collect from the beginning of December. 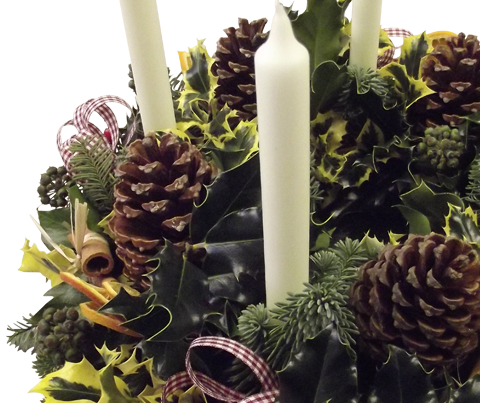 Every December Kaye runs Festive Workshops at which you get the chance to make your own Door Wreaths, Table Centres, Topiary Trees or Swags. Each workshop runs for around an hour & a half during which Kaye demonstrates the design you are making as well as helping you create your own design. All the materials are provided for you and there is also the chance to sample homemade sausage rolls & mince pies as well as enjoying a cup of tea or coffee. Places are limited per session depending on the design to between 4-10 people per workshop. Group bookings are welcome and bookings of more than 2 people are treated to a discount. 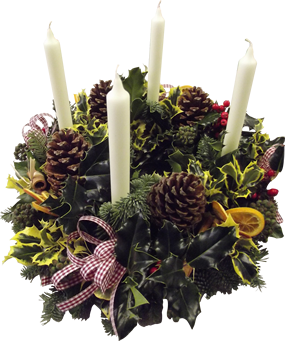 Kaye attends many local Christmas Fayres at which she sells her Holly Wreaths & takes orders for Christmas table centres for delivery as well as bookings for places on her Festive Workshops. To secure your place on the Festive Workshop of your choice the full payment is required; either by cash, payment by Cheque [Made payable to ‘Kaye Souter’] or by Bank Transfer [Sort Code 089300 Account number 22153184 Reference; your name] are accepted. No dates will be held without receipt of this payment. The workshop includes tuition, demonstration and construction of the particular design along with tea or coffee, a sausage roll and a mince pie. All flowers, foliages & sundries are included in this price and you will leave at the end of the workshop with your own design. As is the nature of the business the workshop itself is not heated so it is advisable to wear several layers and sensible flat warm shoes or boots. On behalf of the group it was a pleasure for us all to meet you. We enjoyed the evening very much indeed. Hopefully we will come back for wreath making next year.